The Manhasset Acoustic Shield provides protection to the musician stationed in front of other musicians, without impairing the vision of the musicians behind. 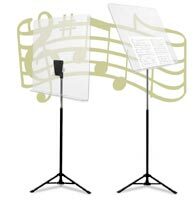 The portable Acoustic Shield adjusts in height from 37" to 66" and is 26" high by 26" wide and is constructed of clear, durable Lexan polycarbonate. 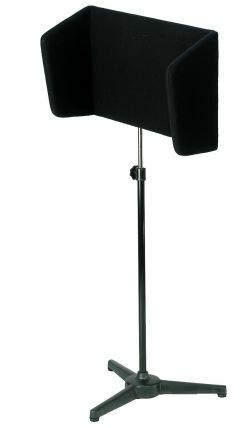 The Manhasset Acoustic Shield features a collapsible tripod base making it very easy to transport and take on tour. With its lower 1.5" ledge, it is also ideal for use as a Conductor's Stand. Wilde & Spieth Acoustic Shield. 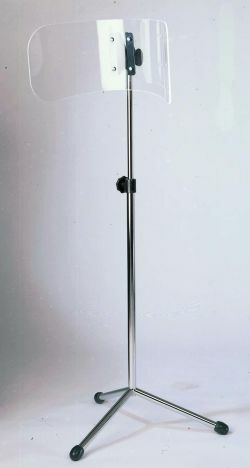 Tripod base of tubular steel with individual curved polypropylene shield. Choice of tripod base available. Wilde & Spieth Padded Acoustic Shield. Three-legged base, the shield is padded and covered with Sopran 310 black to a thickness of 20mm. Sound measure of Accident Insurance Society Rheinland-Pfalz, September 1996: "... sound diminuation to approximately 5 dB..." Used by Cameron Macintosh Productions.